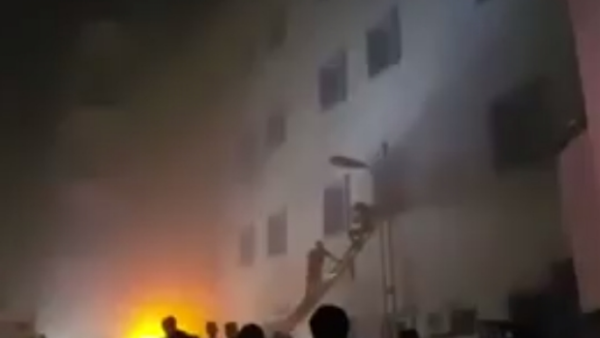 At least 25 people have been killed and more than 100 others injured after a fire broke out at a hospital in Jazan, southern Saudi Arabia, officials say. The blaze broke out in the intensive care and maternity departments of the Jazan General Hospital, the Civil Defense Agency tweeted. The fire is now over and those injured have been transferred to other hospitals in the area, it added. An investigation is under way to find out the cause of the blaze. One witness told Saudi TV an electrical fault appeared to be to blame, and that the fire had swept through the building in minutes. “We could hear the women screaming,” the man said. The fire badly damaged the interior, charring walls and leaving wreckage dangling from the ceiling. Twenty-one civil defense teams helped extinguish the fire, according to the agency. Some Saudis took to social media to complain of what they said was inadequate infrastructure in the area. Saudi authorities also faced heavy criticism earlier this year after a stampede at the Hajj pilgrimage killed hundreds. Jazan is near the border with Yemen, which has seen months of fighting between Houthi rebels and Saudi-backed forces.